Acer has announced its new ultra-wide curved display for gaming and multimedia applications. The monitor boasts with a rare combination of features, such as a curved panel, 2.4:1 aspect ratio, a USB-C input, as well as multiple features for gamers, including a 75 Hz refresh rate, variable refresh via AMD’s FreeSync, and ambient lighting. The new display is about to hit the market, but with a rather high price tag due to its distinctive mixture of capabilities. 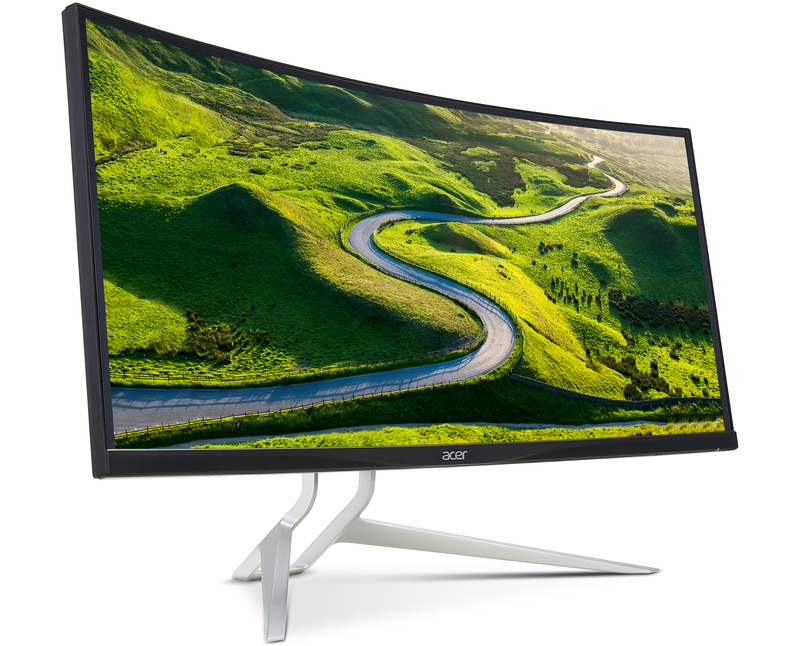 The Acer XR382CQK is based on a 37.5” IPS panel with a 3840×1600 resolution, a 24:10 aspect ratio and 2300R curvature (see the table below for other specs). The distinctive specifications may indicate that the supplier of the panel is LG Display, and we already know two monitors which feature the same screen (1, 2). As reported, the resolution and the aspect ratio of the display are well suited for displaying HD and UHD content filmed in an aspect ratio of 2.35:1 or 2.40:1 (a lot of movies are shot in such aspect ratios) as well as for games. Meanwhile the 8-bit + FRC panel allows the reproduction of 1.07 billion colors, and covers 100% of the sRGB color space. 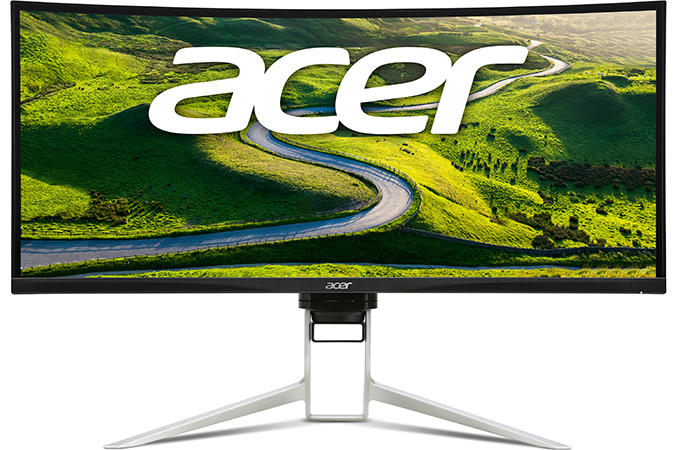 Given the positioning of the monitor, Acer added several features to its XR382CQK that are not available from competitors, including a 75 Hz refresh rate (I suspect the panel is probably overclocked, but not significantly and Acer guarantees that it is going to work fine) as well as RGB ambient lighting that can be adjusted from the OSD (lighting effects include pulse, flash and ripple). In addition, the monitor is equipped with two 7 W speakers with DTS Sound software enhancement. As for connectivity, the Acer XR382CQK has HDMI, DP, mDP and MHL inputs, a rare combination not found on many other devices. Moreover, the new display is also the first gaming monitor that comes with a USB Type-C input and therefore is compatible with various notebooks that have this interface and can use it to connect to external screens. Technically, DisplayPort alt mode on USB-C supports Adaptive-Sync (and hence FreeSync) and therefore the XR382CQK is the industry’s first monitor that may supports FreeSync over USB-C. However, we are not sure there are notebooks with AMD APUs or GPUs that have USB-C as their only display output (and there are no graphics cards with USB-C outputs). In any case, the USB-C input support is a nice feature for the future. In addition, the monitor has a headphone output, which is especially useful for gamers. Update 2/14: As of now, Acer does not activate Adaptive-Sync/FreeSync through the Type-C port because at the moment it is impossible to verify that everything works correctly. Acer says that in the future, if AMD can support Adaptive-Sync/FreeSync through the USB Type-C port, it can use firmware to activate it on its existing models. The Acer XR382CQK is about to hit the shelves of U.S. retailers with a price tag of $1,299.99. Amazon.com already lists the monitor and is even taking pre-orders, but the product is not in stock just yet. "However, we are not sure there are notebooks with AMD APUs or GPUs that have USB-C as their only display output." The new 15" MacBook Pros meet that description, though I don't know off-hand whether their GPUs support FreeSync. I would like to see a 5120X2160 in a 42" curved monitor with features like this one. I enjoy using my 2 Dell 1920X1200 monitors side by side... but they've served me well for many years and won't last forever. I'd like to replace them with a single ultra-wide monitor in the future. Give it time. nVidia supports G-Sync on macOS so it isn't a technical limitation of the underlaying OS.